For his solo exhibition, Finnish artist Axel Antas brings together new C-type photographs and video with pencil drawings to explore our physical relationship to the natural world, and our alienation from it. 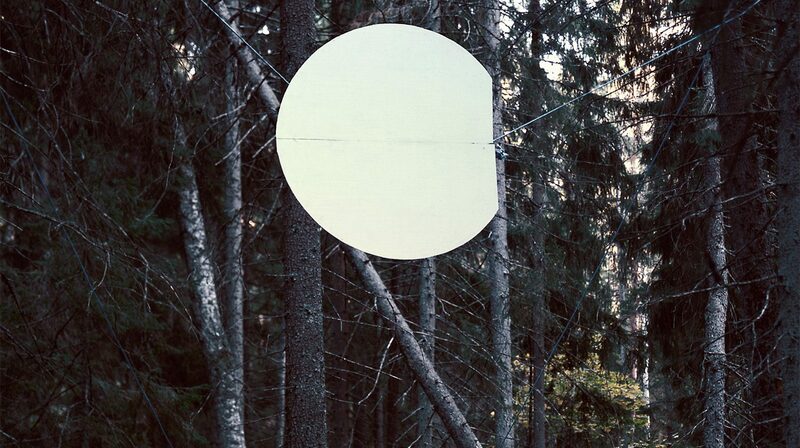 Travelling through the remote forests in the north of Finland, Antas sought out an unfamiliar landscape distanced from his everyday surroundings. Interacting with the trees themselves – silver birch, aspen, spruce – he climbed their trunks, observing how they were affected by his weight. In the Pathetic Fallacy series of C-type photographs (all 2016), circular concrete masses equivalent to the artist´s own weight are distributed within and hung from the trees. In one, the branches arch and droop under this pressure, reaching down for the earth amid a hazy white fog that consumes the surrounding environment. Another sees golden leaves shimmering against silvery bark as the concrete globes hang. These weights animate and anthropomorphise the otherwise still trees; arms, leaves and branches appear heavy and sad, seemingly burdened by an emotional strain. Influenced by a reading of The Tears of Things (Melancholy and Physical Objects) by writer Peter Schwenger, these works speak of how physical objects can situate and define us, personifying our feelings, whilst also remaining autonomous and indifferent. Other photographs such as Binary (2016) depict smoke rings rising from the landscape. With purple foliage in the foreground framing an imposing mottled grey rock, the background´s misty canopy gives rise to the round mass of smoke, which ethereally floats above the treetops. Reminiscent of the curvature of sun or the moon, it surveys the scene below, lonely and isolated in a barren white skyline. At nearly two-and-a-half meters in height, the exhibition´s large-scale pencil drawings, Forest and Ellipse Obscured and Forest and Triangle (both 2016), both exceed human proportions. These delineate the dense foliage of the forest in subtle grey hues. At the central focal point of both pictures, geometric forms such as circles and triangles nestle behind intertwined trees and clusters of roots. In converse to the photographs, these shapes represent voids where weight has been removed, leaving stark white omissions. Produced through a slow, meditative process of calmly and systematically applying graphite to paper, the passing of time is captured in the process of this mark marking, and yet the eye rests on an empty space, the gaze settling upon this nothingness, this hole. Circles and the meditative concept of the void reappear in the video work Lines describing a circle (2016) where Antas has filmed close-ups of his parent´s hands repeatedly drawing these forms in pencil and ink, often with less-than-perfect results. Based upon the Zen Buddhist ensō tradition where a circle is drawn every day, one or two uninhibited brushstrokes expresses a moment when the mind is enlightened and free to let the body create. The circles created by Antas´ parents are symbolic in their imperfection and fragility, poetically expressing the process of our lifecycles, joining together the beginning and the end with a playful and light tone. How can we bridge the gap that exists between our minds and the surrounding world? With the virtual, digital sphere increasingly mediating our lives, we can seem progressively separated from both our own physicality and the tangible, natural realm. Antas seeks to highlight this gap and the resultant alienation that it propagates. By directly affecting the landscape – either through active physical interventions or by removing matter in his drawings – he creates symbolic representations of the body within the environment, rooting us within it and forging a reconnection.